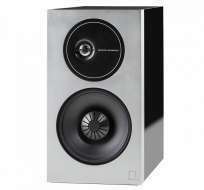 Danish high-end loudspeaker specialist Dynaudio developed the Excite X14A, an active high-end compact loudspeaker. Integrating powerful digital amplifiers, proprietary Dynaudio woofers and tweeters, advanced digital sound processing and featuring user-adjustable settings to finely tune the sound according to room acoustics or listening preferences, the Excite X14A is the ideal active loudspeaker speaker for smart, modern audio systems. All one needs is to connect a volumecontrolled audio source. Based on Dynaudio’s vast knowledge and experience in crafting state-of-the-art active studio monitors and revered compact home hi-fi loudspeakers, the Excite X14A drive units are tailored to match the amplifier electronics, and the amplifier optimized to match the drivers. This creates the ultimate compact audio system: An excellent active loudspeaker driven by a perfectly-matched power amplifier and based on the award-winning Excite X14 passive model. The Excite X14A utilizes a bi-amped configuration to achieve the best result: One 50 watt digital amplifier powers the bass/midrange driver while a second 50 watt digital amplifier powers the tweeter. 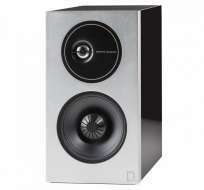 An Excite X14A two-channel setup yields a highlycapable 2 x 100 watt stereo system. Dynaudio has integrated the most advanced digital power amp modules and DSP design to complement the high quality soft dome tweeter and MSP (magnesium silicate polymer) long-throw woofer. A rear-ported bass-reflex design further improves bass performance. 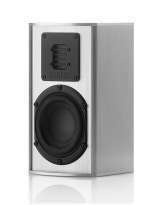 Upon first listen, the musical quality will be immediately apparent: Clear and open, yet perfectly balanced and refined, with an impressively deep and tight bass performance for a loudspeaker this size. Sound staging and imaging between the two speakers is excellent thanks to the meticulous DSP fine tuning and optimization of the digital amplification. The Excite X14A features three equalizer switches that allow one to fine-tune the sonic performance even further, for example when placing the speaker near a wall, corner, or free standing. The bass, midrange and treble can all be individually adjusted in three levels. 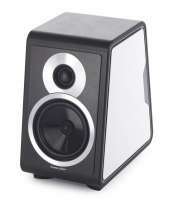 The high-pass filter (60 or 80 Hz) allows one to optionally combine the Excite X14A with a subwoofer. With the high pass filter engaged, lower bass frequencies will be filtered out to be covered by a dedicated sub such as the Dynaudio Sub 250 II. The Excite X14A is available in four different cabinet finishes: Satin White, Satin Black, Rosewood and Walnut. Like all Dynaudio speakers, the Excite X14A is built to the highest standards of quality, in-house, at the company headquarters in Skanderborg, Denmark.